We talked about Shared Services backup and about Exporting and importing Shared Services Provisioning. So now we’ll discuss how to restore Hyperion Shared Services if any provisioning information is lost….or any users are missing!!!!!! from the repository. You can create scheduled jobs to backup Shared Services and export the provisioning information. The following steps are described under the assumption that you have a backup of Hyperion Shared Services repository, OPENLDAP database backup (using the backup.bat file) and a csv/xml file which contains the provisioning information. 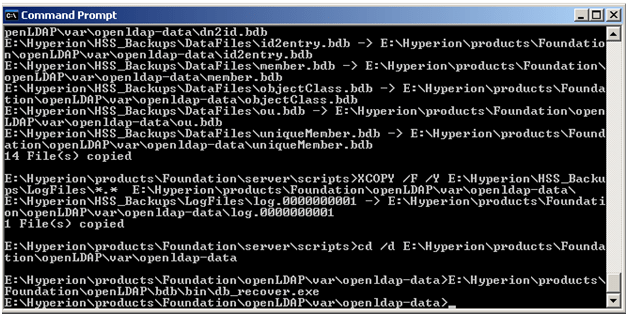 Restore Hyperion Shared Services database from the backup. Make sure that the Time stamp of the Hyperion Shared Services database backup and OpenLdap database backup are matching, else you’ll get issues while binding the database. any users/groups from Native Directory. needed. Can be used for scheduled jobs. any users/groups in Native Directory. What if that there were some issues with the backup (timing difference or issue while restoring) and you lost some provisioning information of 100 users. You can schedule an export of all the provisioning information daily (or take a manual export after a huge change in the provisioning information). 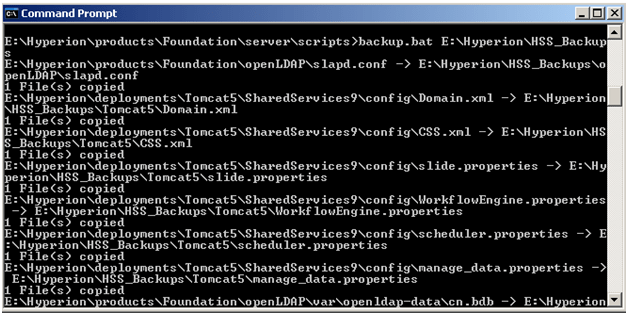 Just make sure that export.internal.identities in importexport.properties file is set to false. If this information is set to false then the output csv file generated, can be used to import the provisioning back using CSSImport.bat file without any changes. Is this applicable for 9.x also…? that is a good post celvin..